"Page 6 - SURE Shortcut Issues"
"The next product on the fail list is the SURE Shortcut." As of October 2014, the SURE Motorsports Shortcut has a .0052 warranty claim rate, all of which were processed between July, 2011, and August, 2011. In the original Shortcut model, the movement of the shift cable's rubber dust cover, or “boot," led to contact with the vertical gear lever of 2010+ Mazdaspeed 3 vehicles. The 07-09 Mazdaspeed 3 and 06-07 Mazdaspeed 6 were unaffected by this issue. This warranty event occurred a month after initial release, between July, 2011, and August, 2011. A new ShortCut model was released in August, 2011, that was compatible with all model vehicles, and the original model was discontinued. 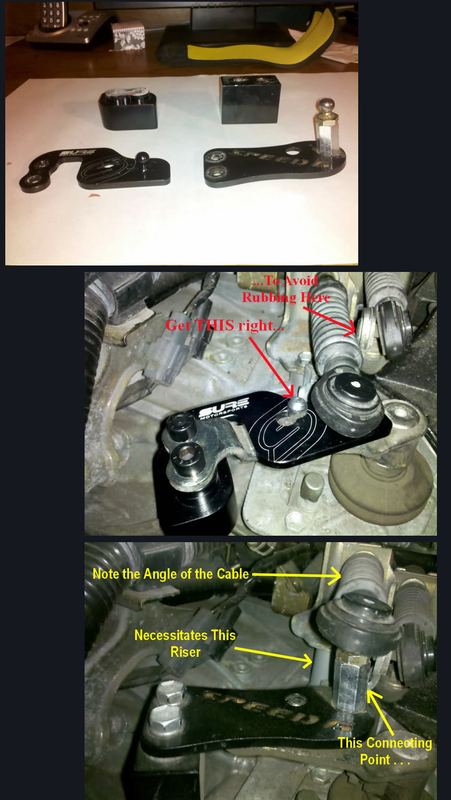 "The shortcut is SURE's version of a short throw shifter. The plate is supposed to reduce the shift throw while engaging the shifter." The SURE Motorsports ShortCut creates a shorter shift throughout all gears by relocating the shifter cable mounting point closer to the center of the gear selecting input shaft. "The problem with this piece is, the rubber boot on the end of the shift cable at the transmission, comes into contact with the metal piece the ball joint connected to." The video below demonstrates the current Shortcut model in use, causing no damage to the dust cover or the shift cable. 1. The SURE Motorsports Shortcut in use. "This causes wear and failure of the cable." There have been no reports of wear or failure to any shift cable with the use of the ShortCut. All nine affected 2010/2011 Mazdaspeed 3 ShortCut owners that experienced excess contact of the dust cover with the vertical gear selector received the current model ShortCut at no charge. 1. The Shortcut depicted has been in use on this 2006 Mazdaspeed 6 since early 2011. The shift cables do not show any signs of wear or failure. "There's another company who makes a similar product and it had a similar problem, but was immediately rectified." In July, 2011, SURE Motorsports identified the ShortCut issue, made all appropriate design changes, and manufactured the revised model ShortCut within 30 days of the reported issue. The revised ShortCut was released in August, 2011. All nine affected 2010/2011 Mazdaspeed 3 ShortCut owners received the new model ShortCut at no charge. There have been no reports of the ShortCut causing damage to the OEM shifter cable. The low profile design of the ShortCut spherical post does not create excessive stress on shifter cable wear points. The ShortCut does not require the addition of a riser to perform properly or to relieve stress on shifter cable wear points. "So, again.. we ask the question, did SURE copy an older design by the other company? Hmmm, its been brought up countless times on the forum." The SURE Motorsports Shortcut was designed and engineered in-house in its entirety. The ShortCut was produced without modeling from an existing product. "Anyhow, here are some pics to prove the point.. and none the less, these were provided by their forum rep..."
The photos published by Kevin Pugh show clear differentiation between the two products.